The family of Kayleigh Haywood said they are "devastated" and "heartbroken" after a body believed to be the missing teenager's was found. The 15-year-old has not been seen since Friday evening when she was dropped off outside Ibstock Community College in Leicestershire. Police found a body at a lake north Ibstock late on Wednesday evening. Two men, aged 27 and 28, have been arrested on suspicion of murder and remain in police custody. Media captionDet Ch Supt David Sandall says he "still needs your help" to find out exactly what happened to Kayleigh "leading up to her death"
In a statement, Kayleigh's family said they were "heartbroken" and "grief-stricken". "There are no words to express the way we are feeling," they said. "We cannot even begin to thank the local communities and wider public for their messages of support which have helped us through the last week. "We are also grateful for the publicity the media have given to Kayleigh's disappearance and the desperate search to find her. "We would now ask that everyone respects our need for privacy at this harrowing time." Residents of Kayleigh's home village of Measham say they have been left "numb" by news of the find. The body was removed from where it was found on Thursday, but has not yet been formally identified as Kayleigh, although her family were informed. A post-mortem examination will be carried out to determine the cause of death. Police were given a final 24 hours to question the arrested men on Thursday morning, which means they will have to bring charges or release the suspects on Friday. 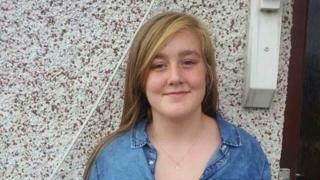 Det Ch Supt David Sandall said: "From the evidence available to us, we believe that the body found is Kayleigh. "Understanding the events leading up to her death, and precisely how she died, is clearly our focus, as is providing whatever support we can to Kayleigh's parents, brothers and sister at this desperately bleak time for them." Kayleigh's family were among hundreds of people who attended a special vigil at St Laurence Church in Measham tonight. There were emotional scenes as the teenager's grief-stricken relatives hugged and kissed each other. The family told the vicar they were overwhelmed by how many people had come out to show their support - so many they were queuing outside the church, all the way down the drive. Flowers were placed outside and purple balloons - Kayleigh's favourite colour - were released into the air. It was incredible to see how many people turned out this evening, and to see the community coming together after such an awful tragedy. Kayleigh is a student at Ashby School but previously attended Ibstock Community College, where she was dropped off on Friday evening. In a statement, Ashby School head teacher Eddie Green, said: "Kayleigh was a lively and fun-loving girl in her final GCSE year who had started Year 11 with a real determination to be successful. "It would appear that this opportunity has sadly been taken away from her." Police said the previous discovery of Kayleigh's mobile phone and belongings, alongside other information, made them believe she had been killed. Det Ch Supt Sandall has urged anyone who was in the Diseworth or Belton areas between Saturday afternoon and Monday morning to contact the force. A body is discovered in a field north of Ibstock at about 22:00. Police say they believe the body is that of Kayleigh. The body is removed from undergrowth next to a lake near Ibstock. An application is granted by magistrates to hold the men arrested for a further and final 24 hours.